Our History （Howa Machinery Firearms Dept.） | Rifle | Our Products | Howa Machinery, Ltd.
Howa Machinery, Ltd. was established in February under the name of Toyoda's Loom Works, Ltd. with the purpose of domestically mass-producing the textile machines which were all imported at that time. 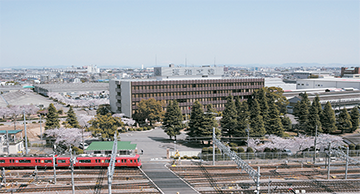 Toyoda's Loom Works, Ltd accepted the initial order of weapons from the army arsenal in Nagoya and started manufacturing. The first product was a hand grenade. 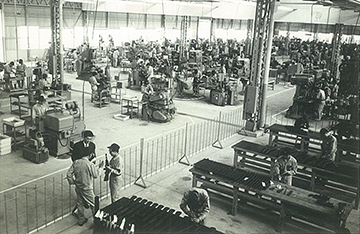 Showa Heavy Industries, Ltd was established and started producing rifles, cannonballs, and parts for airplanes. Toyoda's Loom Works, Ltd merged with Showa Heavy Industries, Ltd and was renamed Howa Heavy Industries, Ltd.
During the WWⅡ, Howa Heavy Industries, Ltd had been manufacturing Arisaka Rifles Type 99, parts of infantry rifles type 38, artillery, machine guns, bullets, and parts for airplanes. Renamed as Howa Machinery, Ltd after WWⅡ, we restarted manufacturing textile machinery. At first, producing weapons was prohibited in accordance with Potsdam Orders. However, due to the outbreak of the Korean war the Potsdam Order was amended and producing weapons was allowed. We obtained permission from Japanese government and accepted orders for hand grenade type MK2, 81mm mortar, and parts for airplane bombs from the U.S. military procurement section. Howa had a long-cherished desire that Japan should be defended by domestically manufactured weapons. So we determined to develop a new rifle making use of our experience of the Type 99 mass production. This new rifle was aimed to fit physique of Japanese defense personnel and be accepted internationally. Howa started producing 12.7mm Spotting rifle for a 106mm recoilless gun. To continue manufacturing of guns all year, we determined to enter the domestic hunting rifle market which were all imported at the time. Permission was obtained for the manufacturing of hunting rifles from the Governor of Aichi. Japan’s first tunnel type target shooting range was built. Howa produced the Model 300 carbine, a semi-auto rifle. This was the first mass produce hunting rifle in Japan. Its compact and light design, perfectly fitting the physique of Japanese sportsman meant the M300 carbine was well received by its many Japanese fans for a long time. As a result of our development efforts since 1956 combined with our sophisticated technology, we developed the Type 64 rifle, that was adopted as official equipment by the Japan Defense Agency (currently Ministry of Defense). Jack Weller who is a critic of firearms and former adviser to the NRA, commented at the time “This is the most accurate rifle that I have seen ever”, “Type 64 rifle is the best service rifle”. Howa established the firearms factory that was equipped ammunition storage and ancillary facilities such as heat and surface treatment. Thai Police adopted the Model 300’s improved version as Law enforcement equipment. We exported 10,000 rifles to Thailand by 1966. We carried out improving the design of Model 300 and developed a new Model 300 which was tougher and more versatile. Howa started developing a new rifle which is able to use 5.56mm ammunition, NATO’s second rifle caliber. Howa started to export Howa Model 1500 which was based on the successful Golden Bear rifle. Development of the new rifle that used the 5.56mm ammunition was finally finished. The Type 89 rifle was adopted as official equipment by the Japan Defense Agency (currently Ministry of Defense) in 1989 and deliveries started from next year. 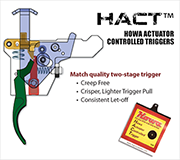 M1500 was upgraded with the introduction of a new type trigger system known as HACT ™・・・ Howa Actuator Controlled Trigger that achieved a crisper, lighter trigger pull in a creep free two-stage trigger. We developed the M1500 Mini Action in addition to the standard and long actions, allowing the production of new popular small sized calibers. Today the Firearms Dept. of Howa that started with manufacturing of weapons in its early years continues to develop and build sporting and defense firearms that are revered in Japan and Internationally. Our experience and accumulated engineering know-how over many years make it possible to develop and manufacture firearms of superior quality that are guaranteed to completely satisfy our customers. Every day our workforce strives to continue this tradition. Outdoor Sporting Agencies Pty Ltd.